Box turtles don't move very fast, and their development is also quite slow. The race isn't always to the swift -- a box turtle's life span is considerably longer than most of its primary predators. Box turtles begin life on their own, with hatchlings receiving no parental care. Because the hinge that gives them the ability to withdraw completely into their shell doesn't develop until about the age of 5, many younger box turtles end up as food for predators. These include raccoons, foxes and skunks. Box turtles mature between the ages of 10 to 13. That's when they first begin breeding. Female box turtles don't actually mate every year, but can still produce fertile eggs, as their bodies can store sperm from a previous breeding for up to four years. Although their maturity might be late by reptile standards, box turtles can live a long time. 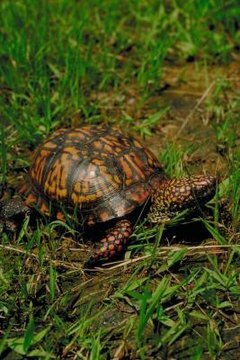 It's not unusual for box turtles to reach the age of 50, with some surviving into their 70s or even reaching a century. Loss of habitat because of development and getting hit by cars during breeding season are major contributors to shorter turtle life spans. What Does a Turtle Egg Nest Look Like After the Eggs are Laid?